At Auto-Therapy, we want to help you experience the long-term enjoyment a properly maintained world-class Porsche automobile can offer. We have been building, servicing, and racing these cars for the better part of three decades. With multiple wins in PCA, SCCA, and NASA we have the knowledge, experience and capabilities to do just about anything you could imagine for your Porsche, Audi, BMW or Volkswagen. Whether your looking for street performance an all out race car or just your regular factory recommended service, we will be happy to satisfy your needs. Roger at Auto Therapy is wonderful! I haven't seen him in a long time but I feel compelled to write a review after seeing some of the negative comments. I bought my used Porsche about 13 years ago. Roger replaced the timing chain and did a lot of work that had been neglected in the car's first ten years of life. I did not have the money to do everything right then. I told Roger I would get some of the work done and bring my car back later. He told me he would do everything while the car was in the shop and I could pay him later. I asked did he want to keep the car until I paid him. He said, "No, I don't want your car!' I was so shocked! He didn't know me from Eve and he really had no idea if I would pay him or not. I did pay him and I would highly recommend him. After all these years, I have only done regular oil changes, had an oil leak fixed and replaced the heating and ac control. Nothing Roger repaired has broken down since. I wanted to replace the broken clock in my car and Roger told me I didn't need to do that because at the time, it would have cost about $400. Roger said I could buy a nice watch for that kind of money! When I told him I wanted to drive my car across the country to a Porsche event, the "Dad" in him kicked in and he told me not to do that. I bought the car used and really didn't know enough about the car to drive it that distance. I live a good distance away and traveling to Gburg is inconvenient even though Roger dropped me at the Metro and picked me up after my car was ready. I don't believe he made any kind of racial comments because if he was that kind of guy, he would not have done all that he did for me. I'll never forget him or his work. After 10 years of dutiful trips to the dealer for routine annual maintenance, I decided to find an independent shop to handle my now ten year old (59k miles) 911. The visits to the dealer have become a constant battle over what was really needed versus what they try to sell. Auto-Therapy was recommended by another Porsche enthusiast. I called Roger, the owner, and he said to come by and he'd review the maintenance records and take a quick look at the car. I did and was impressed with his willingness to do that and also with what he said I didn't need done. I made an appointment for the annual oil change and during that he went though the various things I might expect as the car gets older. He also told me what could be deferred and what might need attention sooner. He also pointed out things while the car was up on the rack for me to see and to consider as the car gets older. All in all, a very good experience and certainly less expensive than the dealer. I was impressed with Roger's knowledge and his daughter, another Porsche owner, who also works with him. I plan to keep the car for a while and will bring it back for the things that go with longer term ownership. Roger seems like an honest and very capable guy who is also very nice to deal with. I think his shop is a great find for anyone in Maryland who is tired of the dealerships. I must say, Auto Therapy is quite possibly the most honest and helpful automotive repair shop in the Gaithersburg area. Roger is a man of integrity, and endless knowledge about the inner workings of a Porsche. Very reasonable prices, and will work with you to ensure that you leave a satisfied customer. "In Business Be Men". Had an earlier review/experience with Roger at Auto Therapy and it wasn't so pleasant. However, I had ran into a new problem with my car which I thought was related to the original problem (trans overhaul). Brought the car in for a reinspect and Roger was very professional. I know that he was upset because the 1st review was not favorable. I can say that he is a true business man. Professionalism first. I would just like to say that he went above and beyond to diagnose my new problem with the best recommendations possible for repair. I would highly recommend this type of man as a person to do business with. Icing on the cake I have no complaints about the original job that was performed there. First time coming to Auto Therapy with a Cayenne, after many online searches for a shop that specializes in Porsche cars. Came in without an appointment and still got seen... Thank you very much for that! I brought in my cayenne after being told by another mechanic that there maybe a transmission leak, which was causing a mayonnaise like substance under oil filter cap and a oil leak. Found out the mayonnaise substance was nothing to worry about and the oil leak was due to drain plug over torqued by the old mechanic. I've owned Porsches for almost three decades and had then serviced various at shops all over the US. It was my first visit to Roger's shop and I was impressed. Roger and his daughter helped me reset an airbag light after another shop started the car with a seat removed causing the fault. Both were friendly and knowledgeable and the cost was very reasonable. 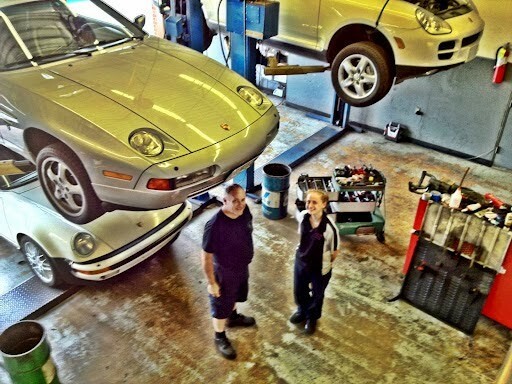 I'll definitely be back to Auto Therapy for all my Porsche service needs. I bought my car in 2003 and have been taking it to Roger since day one. In the summer of 2012,he rebuilt my engine(complete rebuild) due to clogged up SAI ports and contrary to popular belief liquid won't clear them up-he took a drill bit to clear up the ports as I was standing next to him. I trust his advice and expertise implicitly. I've been to Auto Therapy many times thinking I had a problem and he told me that it was a non-issue and that it was part of the small quirks of owning an air-cooled 911. He is fair and honest and will give you advice without sugarcoating the issue. I had a very bad experience with Roger. While in for a trasmission job,I was quoted a fair price initially, however; by the time the repairs were done the price had doubled. It turned out to be the amount that he needed for a cosmetic dental surgery. While paying I was almost fast talked out of $500.00. Did not appreciate the off the cuff racial jargon. To top it all off, when I received my car, it had no pep. I was then told that I needed major engine work that would run into the upper thousands. Had to take the car to another shop for a timing reset which I had to pay for in order to drive my car. Later I discovered that a engine wiring harness was disconnected. You do the math. BeWare. Knowledge of your Porsche is power! Yes transmission job- When told, you were partying one night showing off to your friends and, popped the clutch at high RPM in reverse. Need I say more? Needed gears and upper case to say the least. Talked out of $500.00?!?! He payed in cash ($20's)??? He called that night & left a message about being shorted, then called back and said never mind. Racial jargon?! -I am not even going to go there! And the best one of all. Engine wiring harness disconnected. The car would do nothing if left off! This is a car I have never seen before nor drove. When the customer picked up the car we both went for a test drive. He was happy except for the cost of his mistake. Roger and crew at Auto Therapy are very knowledgeable and helpful. Roger the owner of Auto Therapy and Cal bend over backwards to be helpful, even if it's only just a question on the phone. Help you find parts even if you don't use their services! Nice guys, good work. Recommended!